Of all the sets I researched for this project, the tier 6 Thunderheart set was the most surprising. As someone who did not really play a druid until around tier 9, I simply had very little experience with this set. 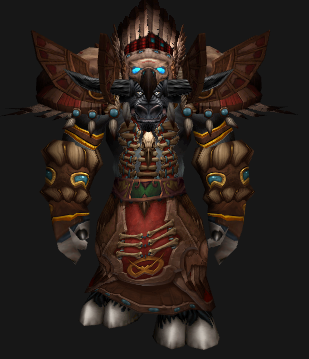 However my research and review of this set shows one of the most class specific looks that simply screams Druid and even more so embodies the spirit of the Tauren race. From the deep blood crimson colors, the war eagle headdress and hanging medallion art to the feathered shoulders, the Thunderheart is both demure, distinct, classic and dynamic all at the same time. I can say with no reservations (no pun intended) that I will seek this set out immediately as we prepare for gear customization in patch 4.3! This entry was posted on September 1, 2011 at 10:46 pm and is filed under General, HFL, Podcast, Raiding, Role Playing, World of Warcraft. You can follow any responses to this entry through the RSS 2.0 feed. You can leave a response, or trackback from your own site.